Advances in FinTech has made it possible to borrow loans without the need of a lot of documents. Paperless application process is the way of the future in the financial industry. Since the demonetization, the term cashless transaction has been taking the centre stage in India’s financial circle. The spillover effect has been seen in personal finance too, where the term paperless personal loan or personal loans without documents have come into existence. Technology has allowed digital lending platforms to address traditional banking pain points and streamline the processes, such as personal loan documents and approval, and the time taken for disbursement. So, what is a paperless personal loan? A paperless personal loan is a financial transaction that happens between the lender and the borrower through digital lending platforms. The personal loan amount, EMIs and tenure are decided during the approval process. There is no need for heaps of photocopies or attested documents, so there is no time wasted in documentation. The process of a paperless personal loan becomes hassle-free since there is no need for hefty paperwork, making frequent visits to the banks or filling and signing form after form. You can apply for a personal loan from the comfort of your home with only a few clicks. The whole process, from approval to disbursement is online, therefore, you can save time and fuel that are often wasted in visiting the bank repeatedly to submit documents and forms manually. With less human intervention, the loan is approved in the shortest possible time. Digital lending platforms undergo stringent security testing and follow the security protocols mandated by the banks. The technology thus ensures that your personal and financial information submitted over the platform remains private and protected. To avail a personal loan without documents through a digital lending platform, you need to first meet their eligibility criteria. While applying for a personal line of credit, MoneyTap will ask you to login to your net banking account so that it can access your bank statements as a part of the loan approval process. This is, however not a security threat as the process is a read-only operation and the security is controlled by the bank itself. 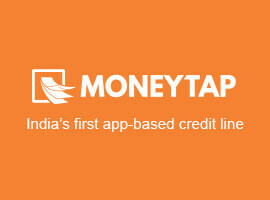 If you still feel uncomfortable, you can download the bank statements and then upload them on the MoneyTap app. If you are new to credit (NTC), it is usually a challenge for the lender to establish your creditworthiness because of your limited or nil credit history. However, through MoneyTap, you can easily apply for a personal loan, get the loan at an attractive interest rate with an opportunity to build your credit history and score. A paperless personal loan through MoneyTap allows you to get a loan without all the hassle of exhaustive documentation.